November’s letter each year is always a bit of a contrast for us when we write it. The month of more solemn Remembrance of the Holy Souls contrasts with the growing festive feeling as Thanksgiving and Christmas approach. We always feel the challenge of covering the spectrum of life’s sorrows and joys in this one letter. But the season of Advent and the frame of mind encouraged by Holy Church always brings opposites together. Advent is a season of penance, but also of joyful preparation. We are meant to recall and feel something of creation’s longing for its Redeemer, but we also know the fulfillment of those longings in our own redemption through Baptism and the Christian life. Even so, Advent reminds us that we are still pilgrims on a journey, passing through often treacherous paths during life, to reach our eternal home. And we long for the Final Coming of our Messias. We desire and look for His final victory and vindication – and ours with His. Advent, with its liturgical use of prophetic texts and prayers, instills this spirit in us as we prepare for the annual celebration of His First Coming as the Babe of Bethlehem. Although Brother Lawrence passed his life in retirement, still there is nobody in any state of life who cannot draw great profit from what is here related of his conduct. He will teach persons engaged in the world to address themselves to God to ask His grace for doing their duty, even while they are performing their business, or in conversation, or in the midst of their recreations. By his example, they will be moved to thank God for His benefits, for the good that He helps them to do, and to humble themselves before Him because of their faults. 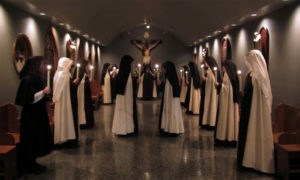 This is not a theoretical devotion, nor one that can be practiced only in cloisters. Everyone is obliged to adore and to love God; and no one can perform these two great duties as he ought without establishing with God an interchange of love that makes us have recourse to Him at every moment, like children who can scarcely stand without their mother’s help. In addition to prayer, adopt the spirit of the Church by taking up some small, hidden form of penance. Advent is called “Little Lent” because the spirit of penance is lighter and the preparation truly joyous. This is not an easy thing to do during December, when the world is in a shopping/partying frenzy of celebration. Here, we can find ourselves as following our Divine Master, for Whom we prepare – a sign of contradiction. It is difficult, and maybe a bit awkward, to set ourselves against the flow of the world’s current! But this little commitment – a silent pact between you and your hidden Savior – will reap rich rewards of the spirit. 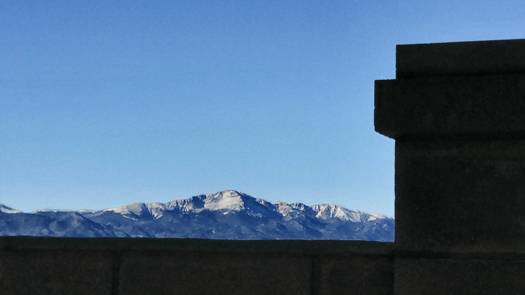 What might “some small, hidden form of penance” be during Advent? Well, if you absolutely love chocolate, give it up until Christmas Eve. How about not eating at all between meals, if your health allows it? Maybe a good penance would be refraining from needless talking during the day; we all know that chatting about not much at all can sometimes be a habit and a huge waste of time – and keep us noisily and busily turned outward, away from the thought of God. Also, try turning off the radio and TV for a while, getting accustomed to a bit of silent time in your day. 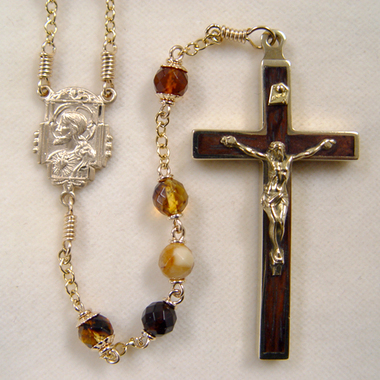 Some may think these pretty superficial offerings of penance, but restraint of this kind can be tough for poor, thoughtless human nature – and “giving up” these little forms of self-indulgence necessarily make us more aware of our behavior and patterns of thought – and more importantly, can turn us to being more attentive to God’s presence. Needless to say, if you know you have a habit of sin, it is ALWAYS time to “give it up”! It might be helpful to consult our selection of good prayer books, and especially a beautiful new edition of the pocket-size prayer book from Father Lasance, Manna of the Soul (reprint from 1926 and recommended by popes). Each and every year, we lament what has become of the season of Christmas and the weeks leading up to it, as mentioned above. Yes, Christmas has suffered dearly at the hands of our secular, commercial world. And we always hate to join in this pre-Christmas frenzy (which starts earlier every year); but since it is impossible for us to send another newsletter before the Feast, we like offer our suggestions for gift-giving each year in this November letter. But along with our suggestions, how about talking about the REASON FOR THIS SEASON? All the decorations, celebrations, even the food, the customs, are supposed to spring from a soul that is full of uncontainable joy of the Feast: God is born! Why do we put up a Christmas tree? Why do we decorate it with lights? Why do we give gifts on this particular day of all the year? 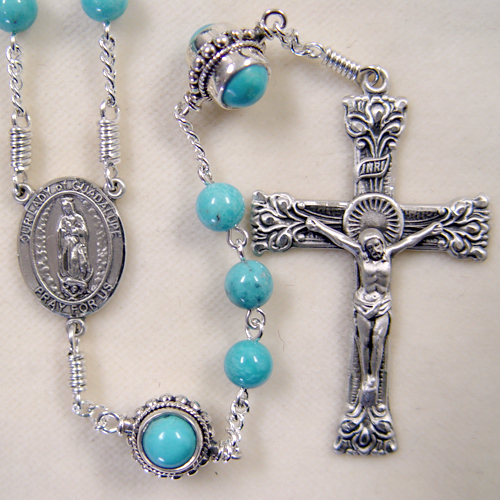 These were essentially Catholic customs long before they were exploited by commercial businesses; but unfortunately, not many of us remember their Christian significance. Father Frank Weiser, S. J. wrote a wonderful book, now out of print, explaining many of the Catholic customs in countries around the world, their development, and their meanings. As can be imagined, a large portion of the book is devoted to Christmas. We cannot possibly cover these topics in full here, but we have posted a large portion of the book on our website for you to enjoy (click here). It’s always fascinating to learn about, and try to reclaim, some of our great Catholic heritage! The Nativity set is both a cherished Christmas custom and a Sacramental. Not many people think to have their Nativity Sets blessed, but they should! It can be a wonderful source of grace and inspiration for your families during the Christmas season. Pictures representing the Scenes of the Nativity are as old as the catacombs, but St. Francis is famous for introducing its current form. On a Christmas night, not long before his death, he called all the villagers to a nearby cave to see a living nativity scene, complete with living animals. Solemn Mass was celebrated, and St. Francis himself solemnly chanted the Christmas Gospel. More about its interesting history can be read here. The Nativity set is a composite picture, combining the many different events of Christmas into one scene. It is meant to be instructional as well as devotional. The number of pieces varies. 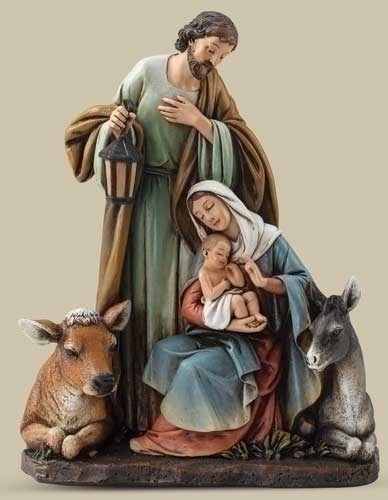 The Holy Family is always present. Shepherds are common, as well as the three Kings. We have always offered complete sets, but this year, understanding that many people may want to choose their own pieces, and also some may not want the expensive stable, we created a “build-your-own” Nativity set section, which will allow you to choose the pieces you want for your family, or perhaps add to an existing set. Another idea is to start a set this year, and then each year add another one or few pieces. This can make the Nativity scene one of the family’s most treasured possessions – and children love the custom of helping with the decision each year! Many of us have fond memories of our Nativity sets as children. One Sister remembers having the three Kings “travel” around the living room, finally reaching the stable on January 6th, the Feast of the Epiphany. Another remembers eating Christmas Eve dinner, picnic style, around the base of the Christmas tree (where the Nativity Set was) while someone read the Christmas story. Here in Carmel, we have our own customs started by Our Holy Mother St. Teresa. The three days following Christmas, we gather around the Nativity Set in the Choir towards the end of the evening mental prayer. After singing some traditional carols, we carry Our Lord in procession to our recreation room. The Nativity Set, as a symbol of all of Christmas, is a central part of many family customs. While we may not know, as children, the deep significance of it all, who does not remember looking forward to placing the Child Jesus in His manger on Christmas! It is customs like these that preserve and enhance our Faith. 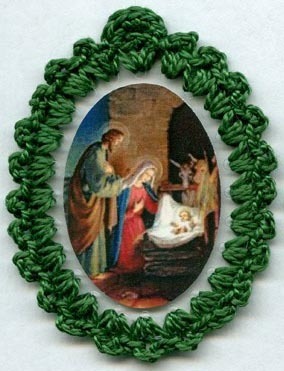 We have always tried to offer a few Christmas ornaments on our site. 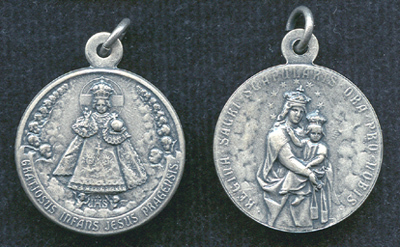 The Little Drummer Boy and ornaments showing the Holy Family have always been among our customer’s favorites. 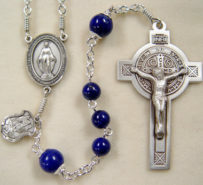 Please remember that the deadline for ordering a custom rosary as a Christmas gift is December 1st. We will do the best we can for orders that come in after that time, but there are no guarantees! 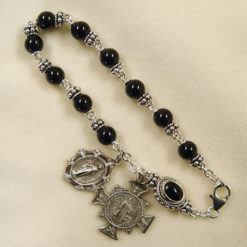 For the procrastinators among us, we have created a selection of rosaries,already made and ready to ship. Gift giving has always been a part of Christmas. It is Our Lord’s Birthday, and we give gifts to our loved ones, recognizing in our fellow Christians the image of Christ Himself. “As long as you did it for one of these, the least of my brethren, you did it for me” ( Matthew 25, 40 ). We also give gifts to represent God’s own gift of His Son to us. In gratitude for this “unspeakable gift,” we give, imitating our heavenly Father. A fine book by the renowned Father Faber has recently been republished, called, simply enough, Little Book of Holy Gratitude. You will be happy to learn of this important virtue of gratitude, especially at this time of year, and of how Our Lord taught of it in the Gospel – and how to be sure that you possess it. A wonderful read during Advent and Christmas time, to remind us what should be the spirit of the giving and receiving of the gifts that we find under our Christmas tree. In European countries, it was often the Christ child Himself who was the gift bringer. The German name was “Christkindel,” or “Christ Child;” perhaps you can all see where we get the name Chris Kringle. In other countries, the gift bringer was St. Nicolaus, a Bishop who put money for a needed dowry in the shoes of young girls while they were sleeping. It is from these, as well as some stories from pagan mythology, that our own “St. Nick” or “Santa Claus” was born. In our continual effort to improve our handmade sacramentals, we have, to use the trendy term, upgraded another of our relic badges. And for us, upgrading means making more authentic to the original and traditional. So now our Mother of Perpetual Help relic badgecarries the authentic copy of the original image, a painting with a wondrous history, which we will save for another newsletter in the future. This title of Our Blessed Mother is one of the most beloved of modern times and bears testimony of her ever present help to her children. In our continual effort to improve our handmade sacramentals, we have, to use the trendy term, upgraded another of our relic badges. And for us, upgrading means making more authentic to the original and traditional. 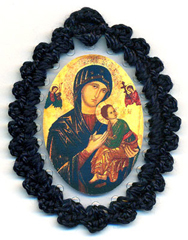 So now our Mother of Perpetual Help relic badge carries the authentic copy of the original image, a painting with a wondrous history, which we will save for another newsletter in the future. 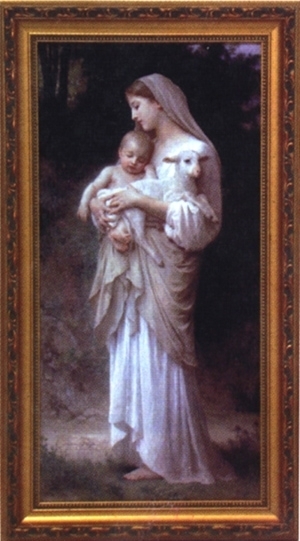 This title of Our Blessed Mother is one of the most beloved of modern times and bears testimony of her ever present help to her children. We discovered the selection of single Christmas cards to be very popular last year, so we keep that option as well as offering our usual packages of cards. New designs and messages to choose from this year, as well as some of the continual favorites. The old adage is, “He who sings, prays twice.” Music has always been a part of Liturgical worship. But more and more, especially in the busy, commercial, secular world (lamenting again here, but fighting back! 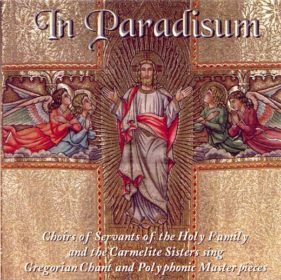 ), many, many people are finding an oasis of peace, serenity and prayerfulness in listening to Gregorian chant, sacred polyphony and hymns. 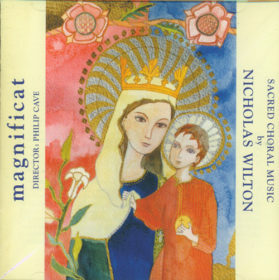 In addition to our own “In Paradisum,” which we now also offer as an audio download, we present the beautiful CD recording of the Catholic English composer, Nicholas Wilton, whose works are performed by the celebrated choir, Magnificat. 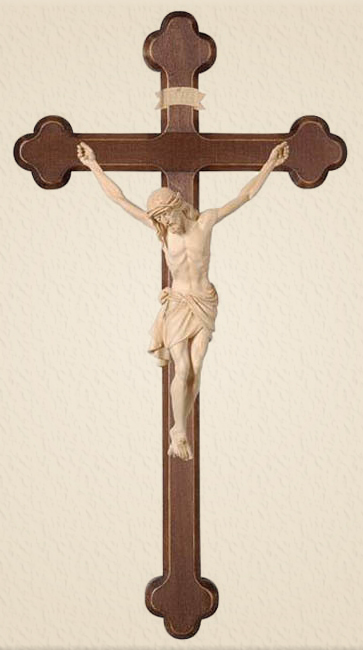 This will make a truly unique and appreciated gift for those who love our holy Faith and those who seek that “oasis” we speak of above. 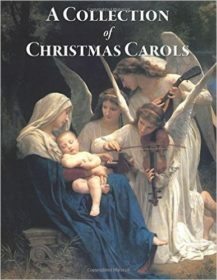 As well, the now classic “Rejoice” Christmas CDs are wonderful listening during the Christmas season, and for those of you who love to gather for Christmas caroling, find the traditional favorites, along with less known traditional carols from all countries, in the 200+ page A Collection of Christmas Carols. This time of year usually means that our Carmelite kitchen is working in high gear. It has been many years since we have done Christmas bake sales for the people who come to our chapel, but we still pull out the flour bins, spices and chocolate chips in order to fill the “Christmas baskets” that we give to our faithful doctors, handymen, grocery shoppers, computer guys and others who are such a great help to our Community. 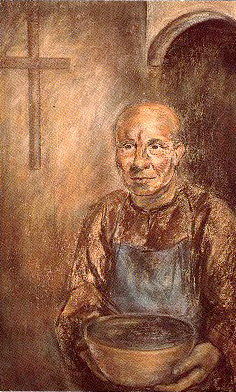 Usually, one or several Sisters can work in the kitchen silently and pretty much in solitude as they work. But Christmas baking days can be a somewhat hectic at times, as the Sisters work around our kitchen island, vying for counter and oven space. A clean bowl might be hard to find, and rubber spatulas are at a premium. Besides our Sister Bakers, there are also our Sister Cleaner-uppers who attempt to stay ahead of the stacks of baking accoutrements! It is a happy time for the Community, since we are not permitted to have a common workroom, according to our Constitutions, and our many and various works do not always allow that we all throw ourselves into a project together. It is a project and time of year when all help… except Zelie, that is. While we were in the kitchen last week, baking up a storm (and yes, a bit of a mess, too), she was in the cloister making a spectacular mess of her own – under supervision, however. Yes, we did deliberately let her do this! A few minutes spent tearing to bits an empty box from the mail burned her seemingly endless energy supply and tired her out enough to keep her happily away from the kitchen – where most of her “pack” remained for a good while on that baking day. Speaking of special foods for the season, we thought we would share another recipe from our favorites: Cranberry Chutney. Our long, gentle autumn kept us enjoying sunny, warm days – and allowed the flower pots in our front courtyard nearly three extra months to keep growing. Without a drop of fertilizer since August, the vine geraniums, alyssum, verbena and other annuals grew luxuriantly, giving visitors to the Carmel a welcome surprise. Of course, all of this came to an end last week, when we got our first hard frost and a bit of snow. What a difference the 40-50 degrees in temperature drop made – the sudden necessary adjustment to the cold! Our long, gentle autumn kept us enjoying sunny, warm days – and allowed the flower pots in our front courtyard nearly three extra months to keep growing. Without a drop of fertilizer since August, the vine geraniums, alyssum, verbena and other annuals grew luxuriantly, giving visitors to the Carmel a welcome surprise. Of course, all of this came to an end last week, when we got our first hard frost and a bit of snow. What a difference the 40-50 degrees in temperature drop made – the sudden necessary adjustment to the cold! As we close this letter, we cannot fail to assure our very earnest prayers for our nation and fellow countrymen during these turbulent days. 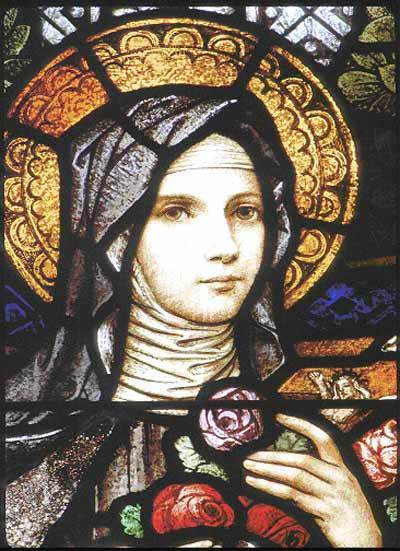 God’s work will not fail to be done in souls – all souls – even those who do not know Him, or deliberately ignore Him. (See another new book, Why Does God Permit Evil?) But returning again and again in faith to prayer, let us all hope for the good blessings that our loving Father wills to give – if we only ask.